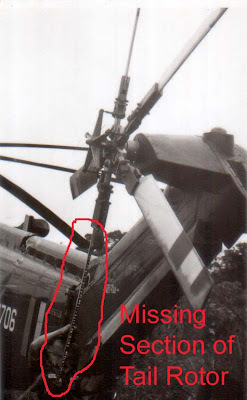 Readers...My last posting was on the broken main rotor blade (click here). Now I was told of an incident of broken tail rotor blades by a very experienced captain, Capt Wong Yoon Fatt of MHS. Many of my friend asked if I have ever experienced a real emergency while flying. The answer is a YES. I have todate about 18,000 plus hours on helicopters and another thousand on light fixed wing so the law of averages catches up once a while. 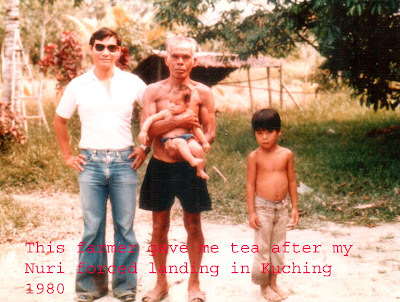 One very serious emergency happened to me 29 years ago when I was serving in 7 Squadron, RMAF Kuching. 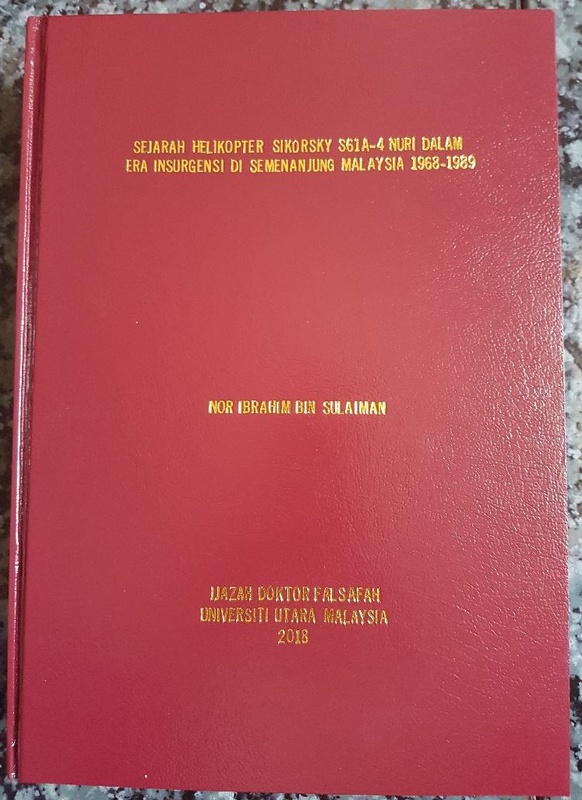 The date was 9 Oct 1980 and I was a new "C" category captain on the Sikorsky S 61 A4 (Nuri) helicopter in the Royal Malaysian Air Force. Looking back at my log book I had just accumulated 1000 hrs at that time. On that eventful day, I was tasked to do a training flight with a co pilot. This is the time when we polish up our flying skills and in those days every pilot has to do 3 hours of training flight per month. The sortie was a running change with my squadron commander. Running change means the aircraft has been started and flown and I just hop in to take the aircraft to continue my flight. When the squadron commander handed me the aircraft he told me the aircraft had some vibrations and I will have to enter the defect in the tech log after my sortie. So away I went to the training area in Santubong , North of Kuching airport. One of the exercises that we practice is an autorotation..you know just in case both the engines flame out together. I selected an area and did a practice autorotation aiming for that cleared patch. By 500 ft above ground level, I initiated power to recover from the autorotation. Suddenly, there was a "cracking" sound and the whole aircraft and the controls vibrated violently. Pedals vibrations were severe and there was limited control and instruments could not be read. I lowered the collective level and re entered into autorotaion and this time to land. Things happened very fast but suddenly everything seem to come in slow motion. Flashes of family and boyhood seems to come and go. Several MAYDAY calls were made and it was acknowledged by an MAS aircraft. What seemed like a nice carpet of grass at 1000 ft now looks like a swamp and worst of all there were a lot of abandoned poles sticking upright. These poles were for the pepper farm and it is solid hard wood. Using all the skill that I had been taught in the Air Force, I managed to avoid the poles (otherwise it will be a satay helicopter!). Of course, my co pilot Lt M (u) Kamal (at that time) and Sgt Sharom played an important part in the successful forced landing. After securing the helicopter we found the tail rotor blades had self destructed leaving only the spar. In those days, the tail was made of several rib pockets but after my incident (maybe a few more in the world) the blades were changed to honeycomb structures type . The man in this picture is the first person to come over to the aircraft after I force landed. He gave us some hot Chinese tea which was very much appreciated. I revisited him a few days later and took this photo. 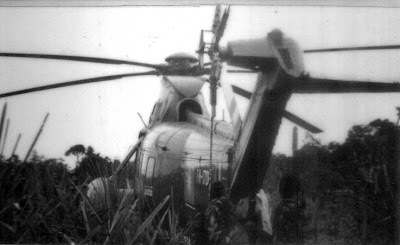 Within an hour another Nuri helicopter came to our rescue and we were flown back to the base. In order for me to maintain my confidence, they made me do another flight the next day..a good idea. 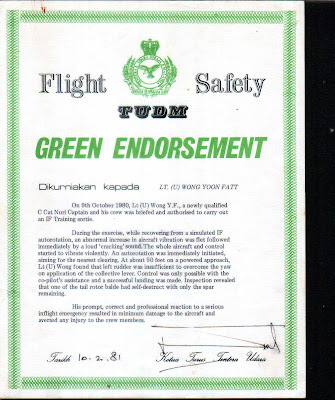 The department of Flight Safety recognised that I had done a very good job and awarded me the Green Endorsement. This is the highest award for display of airmanship and skill in avoiding major disaster. I had been truely very lucky. However, throughout the later years I had several engine failures (seven in multi engine helicopters) and many more emergencies when I was flying microlights. I will write about it in this blog later. What all these emergencies had done to me is to make me a more matured and conservative pilot and not to take things for granted. In flying, there may be no second chance and as pilots we must take our chosen profession seriously. Dear Friends....If you could spare a few minutes of your precious time, why not pen down your experiences and email them to me. It is high time to let the rakyat know the contributions towards nation building via thee irons birds for posterity. And, if I have enough materials, I might seriously think of publishing another book, insyaAllah.